A divine, easy cookie that I made up because I had a ten pound block of gianduja (Callebaut’s hazelnut milk chocolate — like Nutella’s richer, classier and more delicious cousin) to get rid of. It’s going folks, slowly, but surely. I may weep a little when it’s actually gone. I made these for a friend’s birthday party after the caramel layer I was planning broke and started burning and spitting clarified butter all over the stove — very unattractive. After chucking that mess, I rushed to whip these up and ran to the party leaving them behind! There is a lesson in there. I believe it is: If you forget to bring the dessert with you, you get to keep it all for yourself. YIPPEE!! For the base I used the one from Flo Braker’s Pecan Diamond Recipe for her award winning, awesome book, "Sweet Miniatures", get it if you don’t have it! She is one of my favorite pastry peeps, on par with Rose Levy Bernbaum and Maida Heatter. I have never shopped for gianduja in New York, but they have quite a selection at Chocosphere, a brilliant online chocolate shop! Preheat oven to 375. Line a 13” x 9” x 2” pan with a piece of baking paper or parchment so the edges of paper overhang the long sides of the pan by one inch. The Base: Blend the flour, sugar and salt in the food processor with the steel knife, add butter all together. Whisk egg and vanilla together. With machine running, add egg mixture and process until ingredients form a ball. Press mixture into the pan with your fingers. Smooth until it’s fairly flat and even, then prick with a fork and bake for 18 minutes. It should be cooked, but not browned. If it has risen anywhere, just prick it with a fork to release the air and gently press it back down. Cool. Hazelnut Ganache Layer: Process the gianduja in the food processor with the steel knife, until it’s finely ground. Heat the cream in a heavy saucepan stirring gently, until tiny bubbles appear at the edge of the pan. With the machine running, pour hot cream through the feed tube and process until the mixture is smooth and melted. Pour and spread ganache over the base. Refrigerate to cool and set. Chocolate Layer: Melt the semi-sweet chocolate and the 4T of butter over hot water (double boiler with just simmering water is perfect) until it’s melted and blended. Pour over hazelnut ganache and spread evenly. Top with chopped hazelnuts. Refrigerate to cool and set. Lift cookies from the pan by the baking paper. 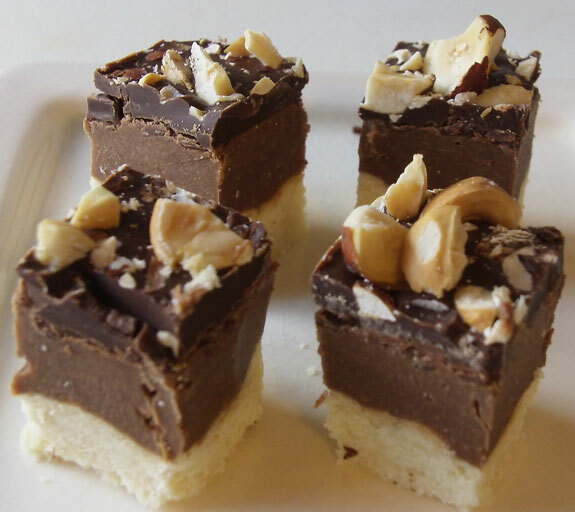 Put it on a cutting board and cut into 3/4” squares — the cookies are very rich and these are the perfect bite size. I store them in the refrigerator stored in an air tight plastic container.